Temecula market has hit a record low when it comes to inventory. 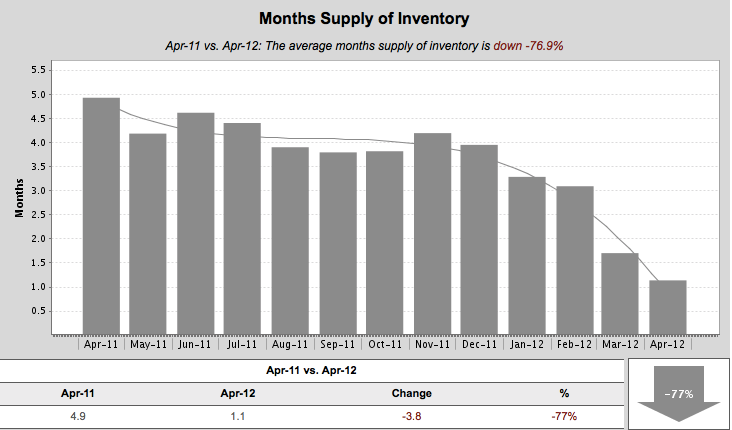 At the end of April of 2012 we’re down to a record 1.1 months worth of inventory. A normal market (in equilibrium) has approximately 6 months of inventory. A slow market can be more than 12 months. Well, here we’re down another 77% from last month and effectively down to 1.1 month. What does that mean for a home buyer and a home seller in Temecula? If you’re a home buyer it will be a little more challenging to get your offer accepted. We recommend to use a very skilled Realtor who is trained at writing offers (without overpaying) and who sells a lot of homes, especially in this market. The market in Temecula is very hot and there are several reasons: Temecula is ranked 2nd safest city in America, schools are highly ranked top 20% in the nation, where Great Oak was ranked top 3% in the nation, American Lung Association has ranked Temecula as “A”, and it’s still very affordable.